Being involved in the process of planning some system of interacting the objects, or in other words, being engaged in the object-oriented design in order to solve some software problem as one of the approaches used in the software design, you may find the ConceptDraw DIAGRAM diagramming and drawing software a really useful tool for making the needed drawings, such as the IDEF Business Process Diagrams. 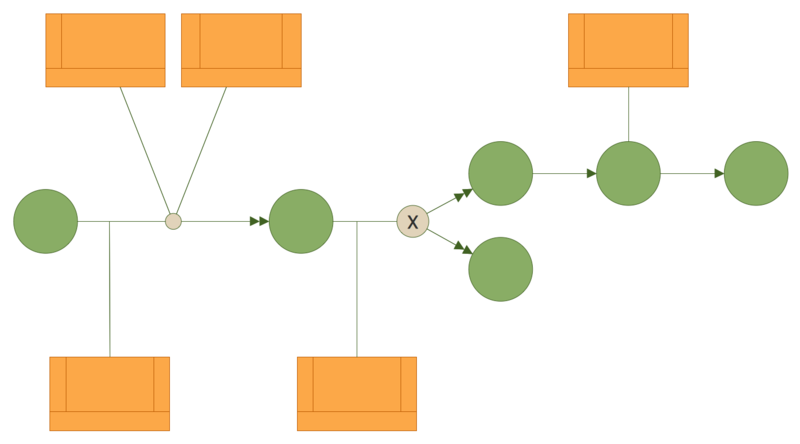 Having the IDEF Business Process Diagrams solution from the relatively new product of CS Odessa would be also a benefit as it allows all the ConceptDraw DIAGRAM users to create the IDEF Business Process Diagrams within only a few minutes using the pre-made stencil libraries as well as the examples. There are altogether four libraries that are included in the previously mentioned solution: the “Design Elements — IDEF0” one, the “Design Elements — IDEF3 Object Schematic Symbols” one, the “Design elements — IDEF3 Process Schematic Symbols” and the “Design Elements — IDEF3 Referents and Notes”. Choosing any needed of them depends on the tasks you need to complete as each of them has its own unique design elements. Thus, in the “Design Elements — IDEF0” stencil library there are such design elements as a Box where a “Function name” can be mentioned, the Arrows named “Straight the segment”, “Straight the arrow segment”, “Curved arrow segment; corners are rounded with 90 degree arcs”, “Forking arrows”, “Joining arrows”, “Tunneled arrows; Use the Action button to reverse tunnel” and “Dotted line”. There are also Control arrow, Input arrow, a Mechanism arrow, a Call arrow and an Output arrow available for any ConceptDraw DIAGRAM user to have as long as both the ConceptDraw STORE application is downloaded and the IDEF Business Process Diagrams solution from it. Software design is known to be the process by which any agent can create some particular specification of a software artifact. The mentioned specification may be known to be intending to accomplish some particular goals by using a set of some simple components as well as the subject to constraints. Any software design may refer to either the activity of following the requirements’ specification in a stylized software engineering process or all the possible activity that is known to be involved in conceptualizing, implementing, framing, commissioning and modifying complex systems. Software design is also usually known to be involving the process of problem-solving as well as the process of planning some software solution, including both a low-level component and algorithm design as well as another, an architecture design known to be “high-level” one. To help the IDEF Business Process Diagrams get complete on time, the IDEF Business Process Diagrams solution can be used anytime by any ConceptDraw DIAGRAM user as long and they have the ConceptDraw STORE application downloaded from this site as well. Any object is known to be containing some encapsulated data as well as the procedures that are all grouped together in order to represent some entity. The so-called “object interface” is the one defining how exactly the object can be interacted with. Any object-oriented program can be described by the interaction of such objects and the object-oriented design is what the discipline of defining the objects as well as their interactions called. The mentioned objects interactions if what is used for solving the problems that were both identified and documented during the object-oriented analysis. A description of the class-based subset of object-oriented design follows next, not including the object prototype-based approaches. Such approaches are known for being the ones where the objects are typically obtained by cloning other (prototype) objects, such as their prototypes, but not instantiating the classes. Any object-oriented design is what a method of the design known that can encompass the process of the object-oriented decomposition as well as a notation. It is being done for depicting both physical and logical, dynamic and state models of some system under design. Any input used within the object-oriented design is known to be provided by the output of object-oriented analysis. Realizing that any output artifact never needs to be completely developed in order to serve as input of object-oriented design, both design and analysis may occur in parallel. In practice, though, the results of one activity can feed the other one through an iterative process in a short feedback cycle. Both design and analysis can be performed incrementally. Also, all the artifacts can be continuously grown instead of completely developed in one shot. The examples of the input artifacts used within the object-oriented design can be a conceptual model and user interface documentation, as well as the so-called relational data model. There are also known to be five basic concepts of the object-oriented design that are simply the implementation level features built into the programming language, having such names as Object/Class, Information hiding, Inheritance, Interface, etc. The design principles as well as the strategies are: the dependency injection that is known to be the basic idea affirming that in case some object depends upon having an instance of some other object then the needed object is known to be "injected" into the dependent object, and an acyclic dependencies principle that can be referred to the dependency graph of some components as well as the packages where there are no cycles at all. The last one also is known to be referred to as having a directed acyclic graph and it can also be created with the help of the ConceptDraw DIAGRAM diagramming and drawing software as well as the other needed drawings. 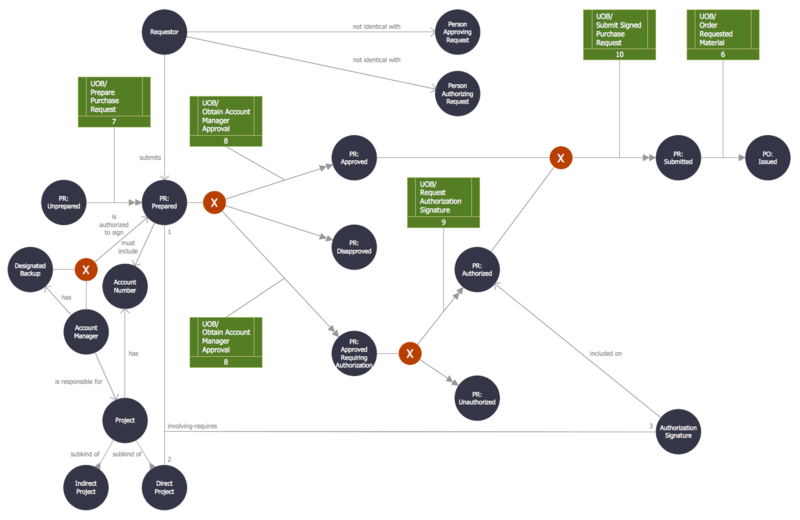 ConceptDraw DIAGRAM v12 extended with IDEF Business Process Diagrams solution from the Business Processes area of ConceptDraw Solution Park is an ideal software for effective database design and drawing IDEF diagrams visually representing all steps of database design process. 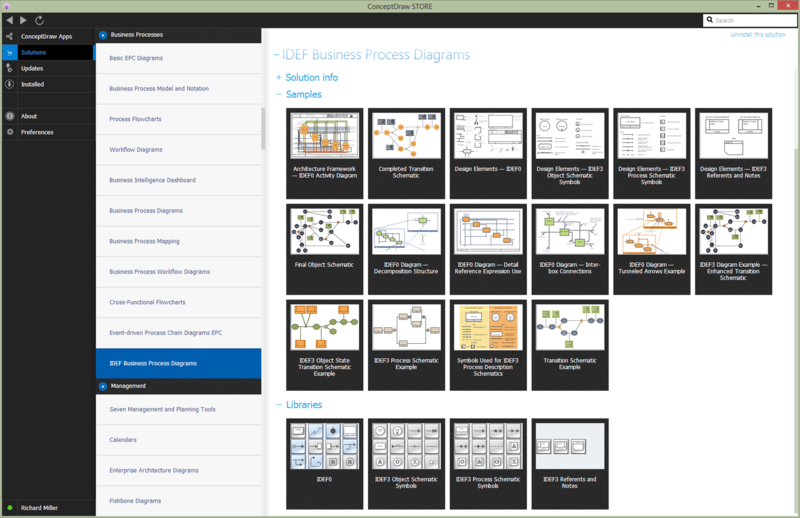 IDEF Business Process Diagrams solution from the Business Processes area of ConceptDraw Solution Park extends ConceptDraw DIAGRAM v12 ector graphics and diagramming software with the ability of fast and easy drawing various types of IDEF diagrams.